Sterling silver, Turquoise, Oyster Shell, Lapis, Purple Agate, and Opal (the matrix in the inlay may vary slightly). Bead pendant measures approximately 3/8" long, 1/2" at widest point, and has a 4-mm opening. Necklace measures approximately 20" long. There is nothing at all average about this beautiful pendant and necklace set! The bead pendant is hand made out of genuine sterling silver and Multicolor Inlay. 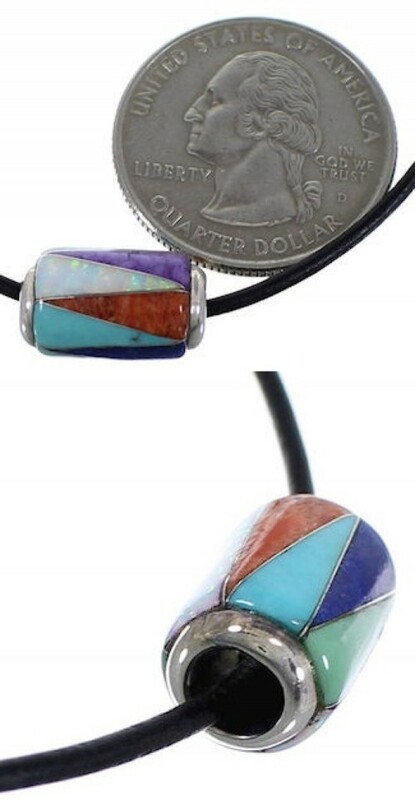 The inlay consists of real Turquoise, Oyster Shell, Lapis, Purple Agate, and man made Opal. The inlay is delicately set, while thin silver lines highlight in between completing the pendant beautifully. The pendant is stamped sterling and hallmarked. The pendant is a part of a set, which includes a genuine leather cord necklace. The necklace may be worn alone or with other pendants and the pendant may be worn with other necklaces.